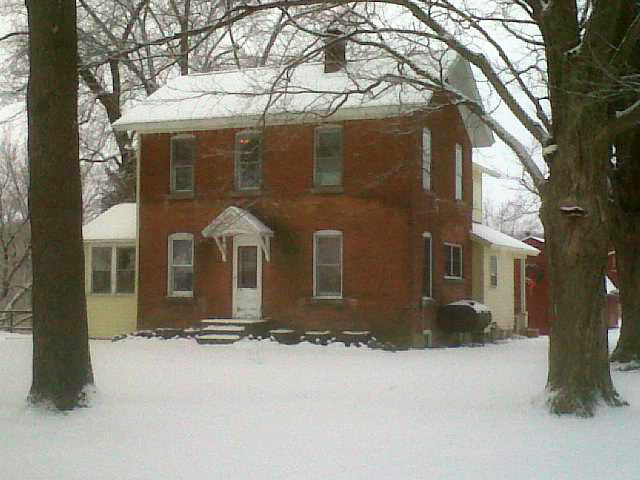 We’ve lived in our old 1890’s farmhouse for just over 15 years. We moved in December of 1995 and started making the place our own. One fall evening, about a month before our closing, my wife Kim drove down to our future home and met with the wife of the couple that was selling the house to us. She wanted to show Kim some of the quirky (but also functionally important) things about the house; where the main water shut-off was located, how the old cast-iron radiators had to be bled in the winter, how the side entrance door (which is the primary entrance) had a tricky bolt lock, the name and phone number of the olde-tymer that serviced the boiler, and numerous other old-house peculiarities she thought we should know. As they were wrapping up the hour or so long tour, my wife, somewhat jokingly, but also with a touch of inquisitive curiousity, asked, “so, is the place haunted?” She was then told the story about Maggie. According to our seller, when they had first moved in, just a few short years before, they experienced several ghostly incidences and in turn decided to give their ghost a name. Maggie, they would call her. Shortly after their arrival, they began renovating several rooms of the house, nothing significant, mostly fresh paint and new wallpaper. During one incident, with no one in close proximity, a full can of paint went tumbling off the top of a ladder as they were repainting the dining room… freaky for sure, but possibly explainable. In a more significant encounter, the wife claimed that one night as she was sitting in the three season porch, she looked over, through the dining room to a small ice cream style table that they had in the kitchen. There, at the table, sat a woman in an early 1900’s black dress and her hair in a bun. When she turned her head then looked back, the woman was gone. She witnessed this woman a second time, late one night, when she awoke from a deep sleep and saw her standing at the end of her bed. Again the visitor vanished after a few moments. My wife Kim took these stories with a grain of salt, left for the evening, arrived home and told me about Maggie. Being reasonable folks, we weren’t going to let a ghost story affect the sale of the house we had fallen in love with. The sale progressed over the next month and we moved in just before Christmas of 1995. A few days after carrying our furniture and our boxed-up life into our new home we took the five-minute drive over to the neighboring Christmas tree farm, cut down a Christmas tree and began making our own memories. For the record, I don’t really believe in ghosts. I just think that if they were really spending time with us we’d have more evidence of their existence. But somewhere deep inside my psyche is a sliver of belief. I’m not sure why… I guess I kind of want to believe in ghosts. I find the prospect of it fascinating. I think the historical significance of ghosts makes for great stories. I’m a huge fan of the hit TV show Ghost Hunters. But in reality, I’m mostly a non-believer. And also for the record, we have never seen or met Maggie. Have we had some ghostly experiences? Sure, most old house owners do. I think that’s a function of houses that settle, that have leaky windows that make ghoulish sounds as the wind sneaks through the cracks and that have older electrical systems. Early on we had a light in a downstairs bathroom that would turn on by its self. One morning, after witnessing the light go on as I sat in the adjacent room, I went into the bathroom, neck-hair standing straight up, and discovered the old light switch was just loose and if it wasn’t pushed down completely when the light was turned off, a few minutes later it would pop back up and voila… the light would go on. One evening as were getting ready to head upstairs for bed, as I approached the stairs I saw the perfectly shaped shadow of a man’s head on the opposite wall. Yes, it stopped me in my tracks and raised my hackles! But after a little investigation we found the source, just a light reflecting off the mirror on the opposite wall and creating a shadow from some items sitting on our dining room table. Even this past Friday, New Years Eve, as I sat at that same dining room table, working on my recent blog posts, I clearly heard my first name spoken in what I swore was my wife’s voice. But my wife was at work on that Friday. “Is Kim home early”, I thought, trying not to be totally freaked out. I called to my daughter who was in the kitchen and asked, “Madeline is Mom there? I swear I just heard her say my name.” “No”, she said, and then proceeded to tell me she thought she had heard HER name in that same area just a week or so earlier, in a kind of quiet, hushed voice. CREEPY!!! Do I have an explanation for those events? No, I guess I don’t, but when I heard what I thought was my name, my son and one of his friends were running around just upstairs. It could have been anything, a noise they made, a sound from their active playing. Same with Madeline’s experience, not enough evidence that it was a real paranormal event. Spooky… yes, paranormal… probably not! However, if there is a Maggie, we have decided that she must be okay with us living here and is, for now, happy to keep to herself. She apparently must be satisfied with us as the current caretakers of her house old farmhouse on Brown Road. We have since done some major renovations to the house (a common ghost aggravator) but still have not met or seen our theoretical guest. That makes us feel better about the possibility of having another resident amongst us. And if it turns out there really is a Maggie, I think I know who she is. At about this time a post office was established in the Mint district (there were five mint stills in the area), through the single-handed efforts of Mrs. Abner Yorton, (maiden name Abbie Hill) daughter of Cornelius Hill, mother of Mrs. Mabel Godshalk. Mrs. Yorton, the busy mother of five children, grew tired of driving to Vicksburg twice a week to pick up mail for herself and neighbors. She contacted the Post Master General who told her if one letter a day was mailed from her area for a period of six months, the government would establish a post office there. As Mrs. Yorton’s husband was a traveling salesman who traveled throughout the United States, she wrote him a letter every day for the six months, drove into Vicksburg and saw that it was properly postmarked. Having this information in hand, with names to boot, I was able to track down more details about this family, whom as best as I can tell, were the original owners of our home, and ultimately came upon the photo below which was given to me by a distant relative who had posted some of the family history on a genealogy website. Apparently the Hill Family was prominent in our rural area during this time period and many members of the family and their relatives are buried in the small cemetery just ½ mile or so up the road from us, including the baby in the center of the photo who died as an infant (thus the mention of only five children above). The older man in the photo (3rd from the right) is Abner Yorton, the salesman mentioned in Water on the Dam. 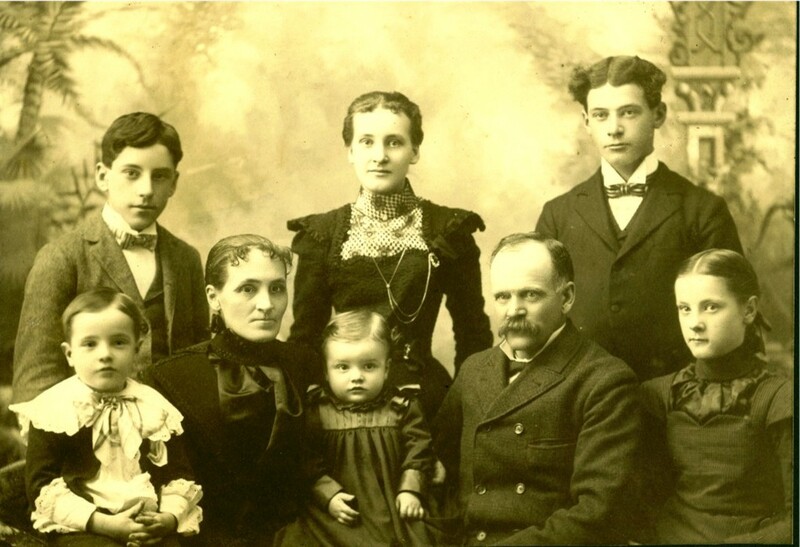 The older woman (3rd from the left) is Abbie Hill… in her early 1900’s black dress and with her hair in a bun. Is Abbie Hill our Maggie? Is there a reason she is possibly still lingering about our house? For now, I’ll assume that Maggie is nothing but a far-fetched ghost story and that Abbie Hill is currently “resting in peace” in her final burial place. If the time comes though, when Maggie decides to introduce herself to us… well, that will make for one hell of a blog post! I love this kind of stuff. I wish I lived in a house with a history. I got the goosebumps at the bit about Maggie standing at the end of the bed. Then I got the tingles when you connected her to the photograph. I got the feeling I did when I watched “The Others.” Oooooh, I’m freaking myself out. Funny thing is, I don’t believe in ghosts, either. I guess we all have that “sliver” of belief. I love stuff like this too, old house and history and ghost stories. Someday I hope to do a little more research on the house and the families that have lived here. I really enjoyed that story. I’m fascinated by the possibility of paranormal activity, and actually believe in it myself. We live in an old farmhouse built it 1920. It sits clear out from the small town that was once known as Big Grove here in Iowa. I’ve often suspected that something bad occurred in our home at one time. Although we don’t hear any squeaks, or see any apparitions, there is a definite foreboding feeling for me when I reached the third stair from the top of our staircase, and several others have felt that around the corner of the top of the stairs in front of a particular room–almost as if it’s left a negative energy imprint. For myself, I get a feeling that someone is about to shove me down the stairs. This doesn’t happen once in a while. It happened right after we moved in and occurs every time I climb the stairs even now six and a half years later. I might add, I have never felt this way in any of the other two-story homes I’ve lived in. So I don’t know what it is, but I only hope whoever it happened to–if it did in fact happen–survived it. Perhaps one day I’ll take the time to do a little research on it. Creepy!!! It would be interesting for you to do some research. Go to your county records building and there is tons of info to be had. If you can get a a hold of some names of previous owners, you can search them on the genealogy websites as well, lots of those resources available too. That’s where I found lots of my information. We have a small cemetery down the road from us where several of our “residents” are buried. When you’re talking about old houses out in the country you can be somewhat confident that people did at one time or another pass away inside the house. Hopefully yours was nothing sinister… Pretty neat stuff!! I like your house, Steve, even if it does have a ghost…she looks rather stern in the picture, but she was probably PO’d about having to sit still so long! Thanks Wendy, we love it too. You’re probably right about the photo!! I read something somewhere about those old cameras, by some guy who collects cameras. He said yes, you had to sit sometimes close to 2 minutes for your image to be recorded. Hence, the serious expressions of stillness and stiff body postures. Makes you wonder if any of those people then ever laughed at all! Of course, this post has furnished my imagination with a new post idea…. Thanks.